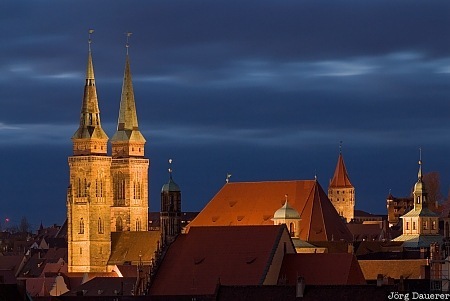 The flood lit Sebalduskirche (St. Sebaldus Church) in downtown Nuremberg at the blue hour. Nuremberg is in Middle Franconia (Mittelfranken) in northern Bavaria, Germany. This photo was taken in the evening of a cloudy day in November of 2010. This photo was the image of the month in April of 2011. This photo was taken with a digital camera.